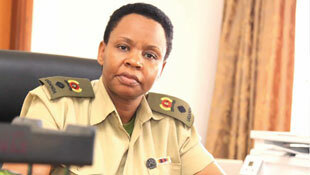 Lt.Col Edith Nakalema will be the new face of Uganda’s anti-corruption drive. President Yoweri Museveni on Monday confirmed she will head a new unit in his office dedicated to fighting corruption. Museveni introduced Lt.Col Nakalema at Kololo where Uganda celebrated this year’s world anti-corruption day 2018. The President admitted frustration at the pace of the fight against corruption, and said Nakalema will be the link between his office and institutions like the IGG’s office that are already in place. Uganda’s public sector is one of the most corrupt in the world – the 151 least corrupt nation out of 175 countries -according to the 2017 Corruption Perceptions Index reported by Transparency International. Museveni announced toll free lines to fight corruption as 0800202500 , WhatsApp 0778202500 and was particularly bitter with police – traffic officers who continue to take bribes, and those who arrest Ugandans for being idle and disorderly. He said the laws being applied by police are colonial. Siima is Editor of Vision Group's Flair Magazine, while Bernard is a city lawyer. Until OTT, do us part. So Siima, that I PROMISE you today. 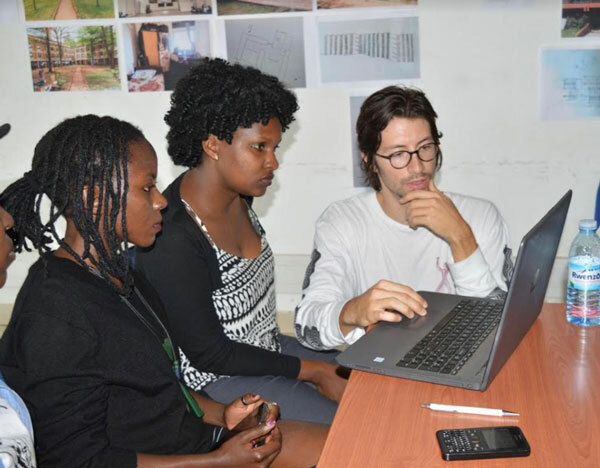 Kampala, Uganda | LOUIS JADWONG | German DJ Sarah Farina and Producer Yo van Lenz are amazed at the local talent they have found in Kampala. They have resolved to create bridges between German Djs and Ugandan ones, and to assist grow talent, and also offer support in acquiring modern equipment. Farina and Lenz starred at the climax of the Mirembe Rhythm concert, dance party and workshop last weekend. They are on a Sub- Saharan African tour. “I loved the concert and was amazed by all the talented DJs. At the workshop, all the girls were super interested in the productions, which was cool and made me happy. I love sharing knowledge, therefore when it’s well received it’s even more fun. It was nice warm energy and good vibes," said Berlin based music producer Yo Van Lenz. Farina was also excited. “We are very grateful that we have the opportunity to be here and connect with something that we love, which is music, and so playing the show with the Ugandan DJs was very nice. We discovered some really talented DJs and we have connected with them already," she said. Dj Farina from Germany shows how it is done on computer. "We definitely want to keep building; this will not be a one time thing. We have got all the contacts and will definitely keep in touch with the people and build bridges between Europe and Africa. We shall exchange, collaborate and support if we can in some way," she promised. "Being a DJ here, it can be hard to get equipment, so we are happy if we can make connections for those people who are interested so that they can get all the stuff they need in order to become the person they want to be." DJ Farina and Producer Lenz. 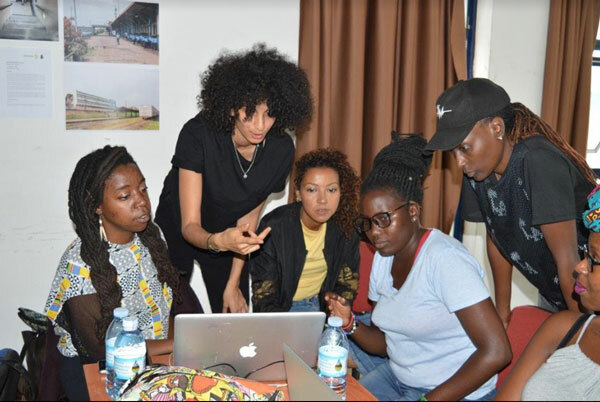 In partnership with Ugandan DJ Rachael’s Femme Electronic, GZK organized a workshop for young women in Uganda to learn about DJing and music production, and also put up the Mirembe Rhythm DJ dance party on 12th October at The Square in Kampala’s industrial area. 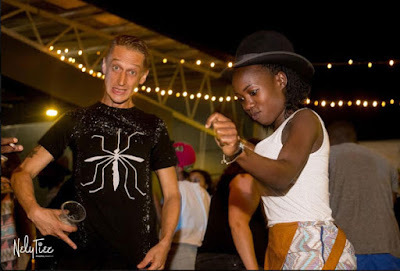 The Mirembe Rhythm concert and dance party was headlined by the Germans alongside Kampala’s crème de la crème of electronic, dancehall and hiphop music: DJ Rachael, DJ Ciza, The Control Posse, Hakuna Kulala and Catu Diosis. 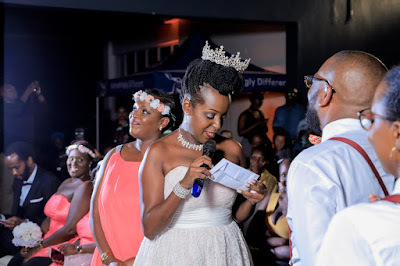 The Square put on a show as Uganda’s celebrated set designer Mirembe Musisi created an Afroparty themed interactive play space for Kampala revellers. The décor used natural materials to make woven light fixtures and other unique designs that made the party feel especially unique. The event kicked off as early as 6pm with board games from Creative Minds, a drum circle by Ngoma Jam Session and some face painting by Marjorie. Gloria Kiconco, the event MC, officially welcomed the first DJ on the lineup at 9pm – and the music played late into the night with a diverse and freedom-loving crowd enjoying themselves into the morning hours. The next day, Goethe Zentrum Kampala held a panel discussion about women in the Electronic Dance Music in Uganda, and then on Sunday offered a free DJing workshop for Ugandan women. Farina revealed that they had made music with some artists. "At the workshop, it was very touching for me especially to have the opportunity to empower other females with DJing and music production skills. It’s just healing and such a valuable experience to create something together and to share knowledge." GZK’s new Director, Barbara Sommer, said of the aim of the event: “ Given that one of the German DJs was female, and connecting to the established relationship between GZK and Femme Electronic and DJ Rachael, we decided to give especially women the opportunity to learn more about DJing in a workshop." Barbara went on to speak of what she felt was achieved in the line up of events. “After having enjoyed a great party at The Square on Friday, October 12th, with fascinating DJs from Uganda and the two DJs from Berlin from dawn to sunrise, the good vibes of Mirembe Rhythm still continued the whole weekend manifesting themselves in the interesting panel discussion on Saturday and the creative workshop on Sunday." Shaniqua Packruhn, another member of the organizing team at Goethe-Zentrum Kampala, added: “At the German-Ugandan Cultural Society, we see it as our mission to promote inter-cultural exchange and support creative processes. In the course of this, Mirembe Rhythm was an excellent opportunity to offer young women a platform for creative exchange and to build sustainable networks." She said the DJ/ Music Production Workshop as well as the panel discussion‚ ‘Pushing Boundaries - Women in the electronic Music business‚’ turned out to be a great success regarding our goal to empower young artists and strengthen creative dynamics. Dj Rachael, one of Kampala’s most prominent DJs and proprietor of Femme Electronic (which partnered with GZK to put the events together), was delighted by the success of the dance party, panel discussion and the ladies’ DJing and music production workshop. “This was the first of its kind. I think it was a great party that brought together different cultures, from Germany, Uganda, Kenya and Congo. Everyone had a good vibe and the party was really great," she said. 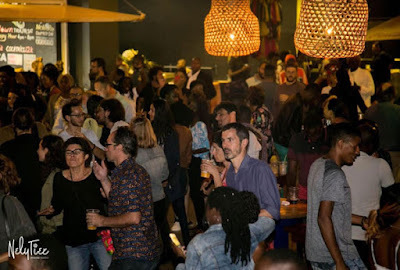 These events were part of an annual cultural exchange, as each year GZK hosts German touring artists in Uganda for performances, workshops and collaborations with Ugandan artists. In 2017, it was “Your Music, Your Voice.” In 2018, “Mirembe Rhythm.” Follow Goethe-Zentrum Kampala on social media as not to miss what comes in 2019! Maseru, Lesotho | FUFA.CO.UG | Farouk Miya scored a brace as Uganda Cranes out-muscled Lesotho Likuena (The Crocodiles) 2-0 at the Setsoto stadium in Maseru Stadium on Tuesday night. Miya opened the scoring as early as the 5th minute with a thunderous shot after good inter-play with Allan Kateregga and Emmanuel Okwi off the right flank. The Croatian based forward playing alongside KCCA’s Patrick Henry Kaddu added the second in the 36th minute with a superbly taken free-kick after a foul on Okwi on the left flank. 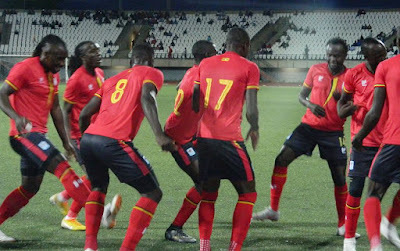 Half time ended with Uganda carrying a 2-0 goal cushion and it necessitated gallant defending from the visitors as Lesotho surged forward for at least a goal back. Goalkeeper Dennis Onyango and the entire defence had to be alert throughout the second half with explicit defending. In the second half, the technical team headed by Sebastien Desabre rung a couple of changes which witnessed left winger Allan Kateregga paving way for Egyptian based Isaac Muleme. Uganda is now on the brink of are within a point of qualification for the 2019 AFCON finals with the last two matches against Cape Verde (home) and Tanzania (away). Congratulations to Uganda Cranes for the 2-0 victory over Lesotho's Crocodiles. I also congratulate Farouk Miya for the brace. I am confident Uganda will qualify for AFCON 2019 in Cameroon. A large fraction of Ugandans who traveled by the chartered flight from Entebbe and those living in Lesotho cheered the Cranes from start to finish. Just last Saturday, Uganda Cranes beat Lesotho 3-0 at Mandela National Stadium, Namboole. A chartered flight facilitated by the Government of Uganda enabled the team reach Maseru on Sunday well in time of the Tuesday game. Meanwhile Tanzania overcame Cape Verde to ascend to 5 points, Cape Verde remains on 4 and Lesotho just two points off four matches. 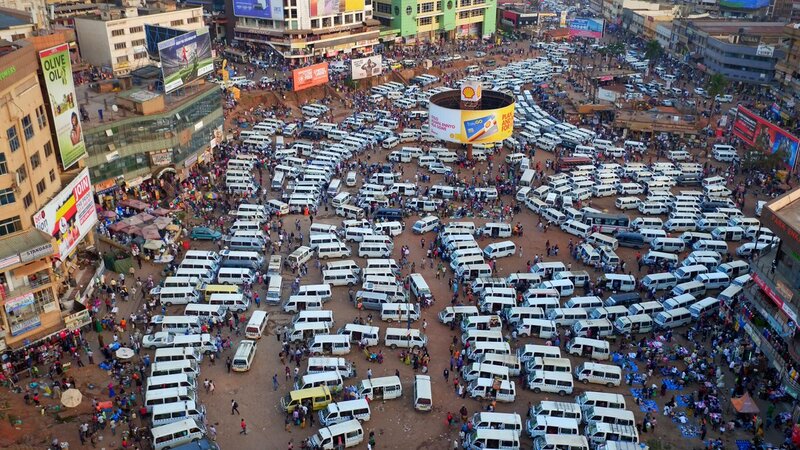 Kampala, Uganda | Government has cancelled daily levies on all Public Service Vehicles and ordered a stop to the use of agents in the collection of park user fees from taxi operators. All PSVs will now make a single annual E-payment of sh720,000 and sh840,000 for taxis, and sh2.4 million for buses, annually. According to Minister of State for Local Government Jennifer Namuyangu, Cabinet made the decision on Monday October 15, where they approved the levying and collection of Park User fees on Passenger Service Vehicles (PSV). Issues of taxes have been a bone of contention with regular on and off taxi operators’ strikes. KCCA' decision to raise taxes last year was halted by President Museveni. The president issued a directive that all daily and monthly taxi levies be stopped. KCCA had raised taxes to sh120,000 monthly at one time. The decision comes hours after Executive Director Jennifer Musisi handed in her resignation. 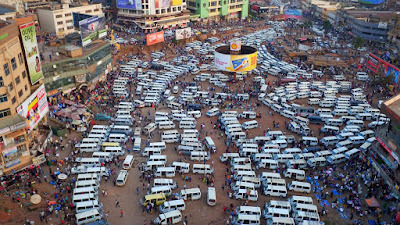 She had in July also just sealed a deal with the Netherlands Ambassador to Uganda Henk Jan Bakker for a grant to the tune of sh4.3 Billion to redevelop Old Taxi Park. (iv) Buses to pay Ugx.2,400,000/= per annum which shall be shared equally among all the Urban Authorities on the Route Charts. (iii) To stop the use of Agents in the collection of Park user fees from taxi operators. 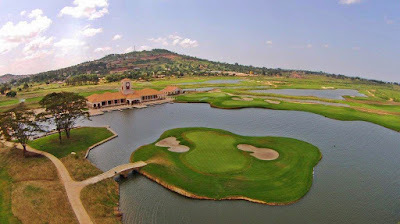 Kampala, Uganda | PHILLIP CORRY | Namulonge golfers showed their mantle on the course as the 1st leg of the Tusker Malt Golf Series teed off on October 12th at the Uganda Golf Club. Namulonge's Denmond Mutyaba and UGC's Jerry Owachi were the first to qualify for the grand final next year with a total of 46 stable-ford points. The 2nd and third runners up slots were won by Namulonge golfers Andrew Atuhaire and Tom Kakaire with 45 points on count back, while Paul Ndyaguma and Moses Mukiibi had 45 points. The Uganda Breweries sponsored golf series will run for 17 weeks, with 7 events around 6 different courses across the country. The overall winners will win an all-expense paid trip to Pattaya, Thailand next year. The next tour on the Series is Toro Club from November 10th. Co-sponsors of this thrilling tour include Shell Uganda, CBA, MTN, Pepsi, Ethiopian Airlines,Kenya Ports Authority. 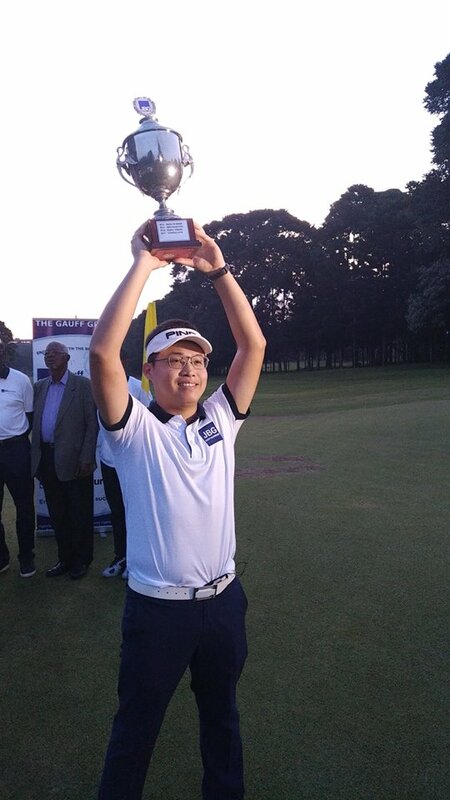 Entebbe, Uganda | PHILLIP CORRY | “It’s the most important trophy I have won and I wanted to win it to emulate Shou Ta Wang who won this tournament in 2014,” Garret Chen said after receiving his trophy for triumphing at the 21st JBG Open Golf tournament Saturday at Entebbe Club. The Taiwanese investor was in fine form, returning the day's best score of 41 points to beat a record field of 246 golfers at Entebbe Club’s biggest tournament. On the day, he was not the only winner. Several seasoned golfers walked away with an assortment of prizes and trophies. JB Gauff, has been a mainstay at Entebbe Club and over the years, having provided equipment to East Africa’s oldest club and at the same time built the club’s facilities on and off the course. Beyond Entebbe Club,JB Gauff have also supported Toro Club. National team golfer Joel Basalaine, was the men’s gross winner with 147 over 36 holes. Uganda Professional Golfers Association secretary Phillip Kasozi, claimed his second tournament title in a space of two months by claiming the Pros category with 215 gross. UPDF’s Geoffrey Orach was winner Group A with 37 points. ULGU president Eva Magala with 38pts was the ladies’ overall winner.